A supernatural thriller set in the legendary Aokigahara Forest at the base of Mt. Fuji in Japan. A young American woman, Sara (Natalie Dormer of “Game of Thrones” and “The Hunger Games”), goes in search of her twin sister, who has mysteriously disappeared. Despite everyone’s warnings to “stay on the path,” Sara enters the forest determined to discover the truth about her sister’s fate only to be confronted by the angry and tormented souls of the dead that prey on anyone who wanders into the forest. Exploring The Forest: Cast and filmmakers discuss their initial attraction to the project and the history behind the Aokigahara Forest; and dive into the characterizations, the visual effects, and the lore of the infamous Yurei in this behind-the-scenes featurette. Eoin Macken is best known to UK TV fans for his role as Sir Gwaine in the hit BBC cult series Merlin. He’s now switched sword swishing and wizardry for the drama and tension of hospital wards, playing the irascible but brilliant Dr TC Callaghan. 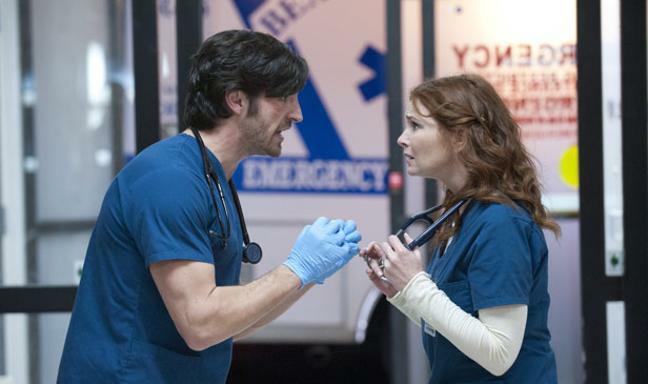 Why do people love medical dramas so much? Usually people run a mile from hospitals. You’re right. The last place you normally want to be is a hospital! But there is so much drama in a hospital and there is so much pathos, it draws you in. Also, everyone has been in a hospital at some point, so it has that hook. I also think our show brings some dark comedy which makes it stand out from other medical dramas. Merlin still has a huge passionate fanbase even though the show has ended. How special is that show to you. The Merlin fans have been so good to me and I hope I’ve been good back to them. They are really loyal and a great set of people. I really mean that. They helped support an indie film I was making and have really supported me. Some of these guys are incredibly talented in their own rights and they all adored this show and in many ways they became bigger than the show. Suddenly it was more than an hour on TV, there was a whole community. Paddy’s In The Boot, the short that received several nominations, starring Kevin J Ryan and Eoin Macken is now ready to watch on Vimeo. Also thanks to Kevin J Ryan for posting it on his FB page. More on Paddy’s In The Boot.